I take one bite and there's only one word to describe this bar: PERFECT. The ratios, the quality, the perfect crunch. Oh man, I want to eat the whole box. The chocolate is rich, abundant, and totally in balance with everything else. My word is this awesome. 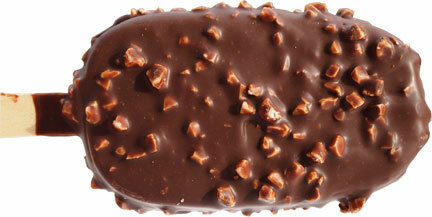 Don't fear jagged bits (cough)Magnum(cough). They are crunchy, but it's not jagged candy cane pieces, it's bark bits and oh man, I'm done already. What did that take? Under two minutes? I cant believe I let these sit in the freezer for a month. They are magnificient. A nice, clean, quality product as always. Well done HD, well done. On Second Scoop: With my daughter sampling bar #2, I was going to leave #3 for my wife... but I had to have this one again. Mmmmm, I really do enjoy this well balanced, well made treat. I don't feel like I need to describe it in depth because it's exactly as expected. 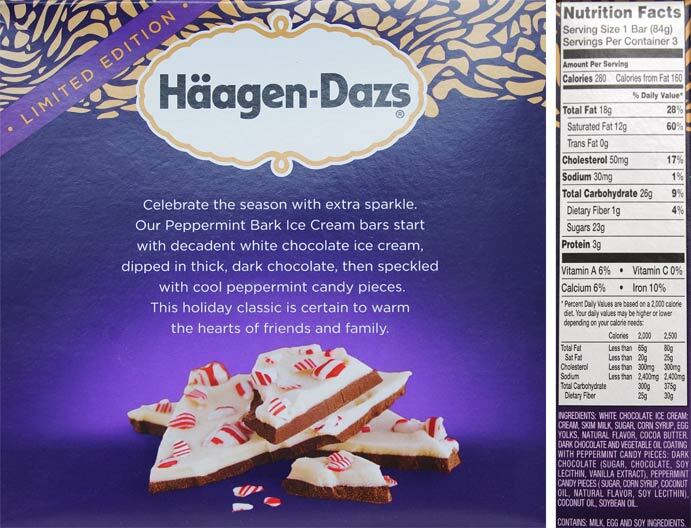 Oh wow these sound incredible - I love peppermint bark so much! I wish there was stuff like this in the UK! I'm more of a carton girl and less of a novelty person, but after your review I need to walk further down the aisle and find these! I just had them for the first time - never saw them before - and they're WONDERFUL. 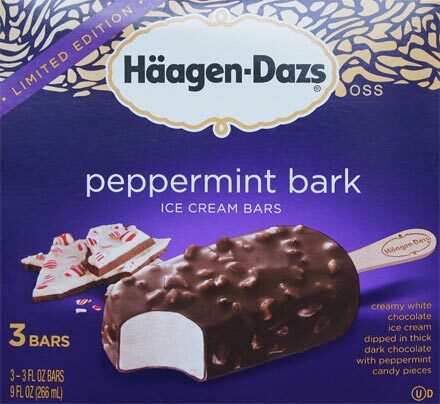 I've never been big on Hagen Daaz ice cream, but the ice cream in this is far more creamy than the usual HD. If you find these in your freezer section, don't hesitate. I'll be going to the grocery store where I found these for more tomorrow. It IS Christmas.